At Trainsure, we understand the importance of individuality and, although it may sound obvious, we also know that when it comes to insurance for the training industry, one size does not fit all. 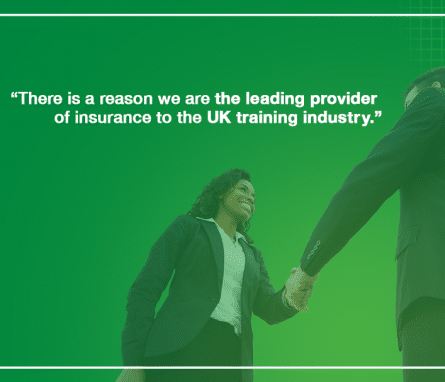 For over fifty years now, we’ve prided ourselves on providing exclusive and bespoke insurance solutions that are as individual as you and are tailored to meet your exact requirements; that’s why we’ve grown to become the leading provider of training insurance to the UK industry. Rather than provide off-the-shelf policies, here at Trainsure, we underwrite our own which not only means you can have a made to measure policy that is specifically designed for your training company, it also means we can price them fairly and even offer you the choice to pay monthly at competitive interest rates. The level of cover will reflect your actual needs and you won’t have to pay for anything you don’t need, you could also cut up to 35% from your current insurance premiums. Your exclusive cover can include Liability for learners, All risks on building and contents, Personal Accidents and Theft without the need for a breakin. All of our products are created to SFA requirements and we cater for anyone within the training sector as well as organisations such as chambers of commerce, training associations, awarding bodies and sector skills councils. As the Insurance Broker for the majority of the original Industry Training Boards, we’re uniquely qualified to advise on all matters related to training and, working closely with the Association of Employment and Learning Providers and the Scottish Training Federation, we stay consistently up to speed on industry changes meaning we can respond quickly to industry demands. Most importantly though, it means you can trust Trainsure to guarantee you’re always fully compliant. The first thing we do is carry out a free audit of your current insurance arrangements with no obligation on your part, this is your first opportunity to take advantage of our expert advice. During this audit, we help you discover whether you’re paying over the odds with your existing policy, whether the existing policy provides adequate enough cover and whether you’re risking your funding by not fulfilling all of your contractual obligations. Once your policy is arranged, we’ll continue to stay in touch so we can make sure that your insurance continues to provide you with thorough ‘all round’ cover throughout the year. Should any changes to your business or the training industry occur, we’ll adapt your cover in response. Furthermore, if you need to make a claim, we promise to settle it as efficiently and as quickly as possible.